With his well cared-for wool suit and his neatly trimmed white beard, Peter J. Adams appears the very picture of affable respectability. The operator in Albert Long Rogers‘ Hagerstown studio chose the popular if conventional vignetted bust style to capture Adams’ amiable personality in this 1880s cabinet card photograph. Peter J. Adams (1818-1889) never made the pages of the news; the Adams family of Hagerstown barely rates a brief mention in Thomas Williams’1,300-page History of Washington County, Maryland. What we know of Adams comes mainly from his obituary, published in the Hagertown Herald and Torch Light on 3 October 1889. He was an early member of the Potomac Lodge of Odd Fellows and a long-time teacher in the Sunday School of St. John’s Lutheran Church, Hagerstown. Beyond the fact that he was born near Mercersburg, Franklin County, Pennsylvania, little is available about his life or his ancestry. By trade a carpenter, Adams is said to have settled in the Leitersburg area of Washington County with his parents around 1832; he married Elizabeth Butler about 1841, and with her had two children: printer and Hagerstown Daily News publisher John Underwood Adams (1841-1911) and Martha Florence Adams. The connection is through Elizabeth Butler, whose sister, Catherine Butler (1823-1887), married Leitersburg area blacksmith J. Henry Weaver (1811-1893), father of farmer Frisby M. Weaver (1845-1913). Peter Adams’ son John surfaces in Washington County history as co-publisher of the Hagerstown Daily News, first with George H. Nock in 1873 and then with William S. Herbert (History of Washington County, Maryland, vol. 1). According to John’s obituary, John U. Adams began his career as an apprentice at the Hagertown Mail. Aside from his vocation, Adams’ two other forays into public life were an appointment as Deputy Stamp Collector during Grover Cleveland’s administration, and a two-year stint as Magistrate. John U. Adams’ daughter, Sarah I. Adams (1869-1963), was a widely liked and respected teacher and librarian in the Washington County schools. Another daughter, Gertrude Adams (1875-1956), married well-known Hagerstown druggist Harry Robert Rudy Sr. (1873-1941) of the firm of Rudy & Meredith, whose drugstore was situated on the Hotel Hamilton Block in Hagerstown. It is hard to pin down the period during which Rogers operated in Hagerstown. In its entry on photographer William B. King the History of Washington County says that Rogers’ Hagerstown studio was located at 48 W. Washington Street, and that King bought it from Rogers in 1887. But according to the Biographical Annals of Franklin County, Pennsylvania, volume 1, Rogers conducted a photography business in Hagerstown from 1887 to about 1890. 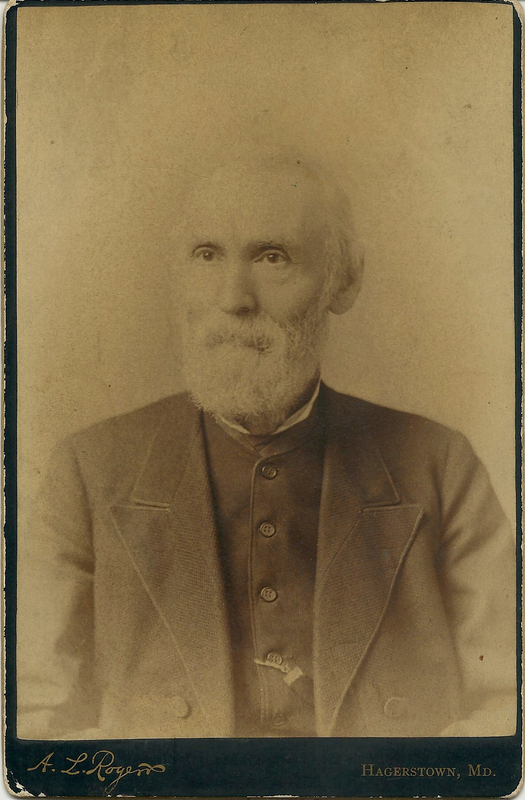 Whether taken before or after 1887, the photograph depicts Adams as an elderly man, so a mid- to late-1880s date for this cabinet card makes sense. Thanks to the Washington County Free Library for providing John Underwood Adams’ obituary, and as always, to the many diligent and generous family history researchers and grave documenters of ancestry.com and findagrave.com. Postscript: Jill Craig of the Western Maryland Regional Library alerted me to Gertrude Adams Rudy’s painting of the Washington County Free Library book wagon. Thank you so much, Jill! I will post a link in my blog to the painting. Neat, Jill–I’ll check it out! Thanks for the tip, and for reading my blog.